Your people may be engineers, accountants, production line workers or sales people, but they are all consumers too. Increasingly, they consume using their smartphones or other digital devices. They are used to getting access to what they want, when they want it. They expect things to happen at the touch of a button. And they bring this expectation into their work lives. These are your consumer learners. WHAT DO CONSUMER LEARNERS WANT? From social media, online shopping or on-demand TV, to booking a restaurant, checking the weather or finding directions, consumer learners are used to being in control. Naturally, they are now bringing this expectation to training and learning in the form of self-directed learning, where they choose the topics and content that are important to them, at any specific point in time. Deloitte’s seventh annual Mobile Consumer Survey, State of the smart, found that 85 percent of 16-to-75-year olds in the UK now own or have access to a smartphone. Deloitte by Bersin research shows that employees consult their smartphones an average of nine times an hour. 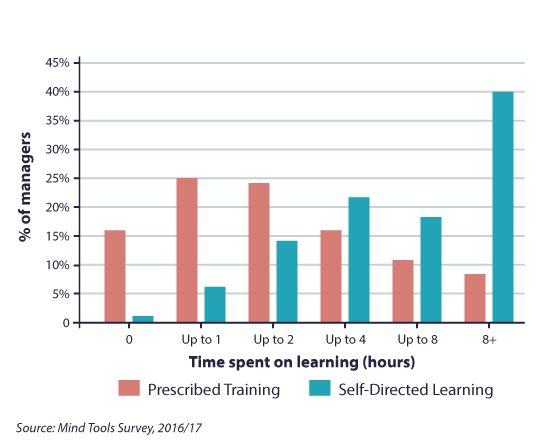 A recent Mind Tools survey found that 40 percent of managers do eight hours or more self-directed learning per month. And they do a lot of it in their own time. Consumer learners are used to being in control. How do you know what your people are learning, if they do it on their own? How do you know they are learning from trusted sources? Research from CEB Global (now Gartner) suggests that employees waste 11 percent of their time every day on learning that doesn’t help with their job. If they feel that your organization doesn’t provide the kind of training and learning they want, how much damage is this doing to overall employee engagement? Some organizations may consider that the rise of the consumer learner is a “get out of jail card,” shifting the burden of learning from the organization to the individual. Research suggests that this may be a very short-term view. Quality training and learning opportunities provided by the employer are often highly ranked in employer engagement surveys. It’s important to people that they have good opportunities for advancement and it’s the organization that provides it. Analysis of more than 1.4 million employees by Gallup shows that organizations with a high level of employee engagement report 21 percent higher productivity than those with lower levels of employee engagement. Highly engaged organizations are also much better at retaining their people, with 25 percent lower turnover of staff. The average cost of replacing an employee can be as a high as $109,676, (when you factor in lost productivity, hiring costs and resources). 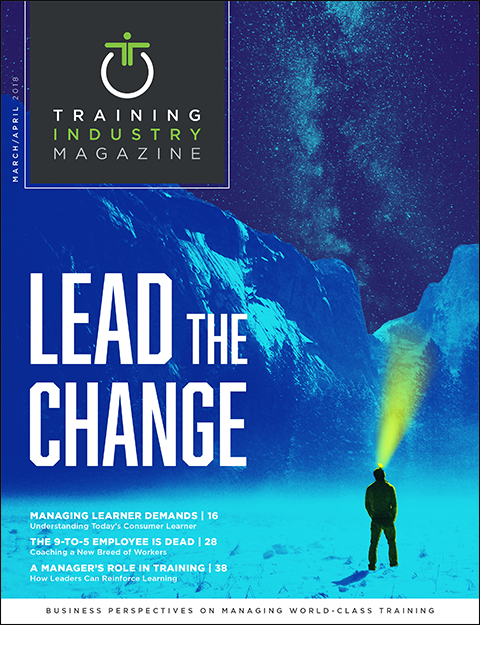 Driving up engagement through better training and learning provided by you, the employer, can make a significant contribution to the bottom line through staff retention alone. No one is saying that traditional classroom or face-to-face training is obsolete. It plays a key role in many training scenarios and can’t just be replaced online. After all, if someone needs to learn how to drive a forklift truck, videos can be really useful, but ultimately, they need to climb aboard and turn the key. What is clear is that online training and learning is a core expectation of any quality employer in 2018. If you fail to provide that, it may be one more reason that valued employees may become disenchanted, disenfranchised and perhaps disappointed enough to look elsewhere. Training when I need it. An “always-on” culture means that your consumer learners no longer distinguish between in and out of work hours when it comes to training. Giving your people resources that they can access where and when they need it – whether that be at their desk, on their commute, or while waiting for a meeting to start – is vital. Our research suggests that training and learning takes place throughout the week, including evenings and weekends. Quality resources I can trust. Oxford Dictionaries declared “post-truth” as its international word of the year in 2016, following high-profile online news stories accredited to sources that were actually fake. A report by Stanford University concluded that there were more than 150 fake news stories during the 2016 U.S. election campaign, reaching millions of U.S. voters. Analysis by Buzzfeed shows that in the final three months of the U.S. election, fake news stories on Facebook generated more engagement than the top news stories from major news outlets. If your people are using unreliable sources, this will have a directly negative impact on their effectiveness – and on that of your organization in the long run. The key is to invest in a solution where your consumer learners can easily search for what he or she needs, while you can remain confident that he or she is accessing high-quality, highly relevant sources that will benefit them and your organization. Lots of different formats, please. Whether they have 10 minutes to watch a video on the bus or wish to spend their lunch break catching up on a webinar, having a choice of formats is important to (and expected by) your consumer learners. Our research shows that people are learning from traditional classroom-based sessions as well as forums, webinars, videos, podcasts, workbooks and blogs. Do your consumer learners have access to this breadth of formats? Give me broad options to pick from. To enable this flexible and accessible style of learning, your people expect to have access to a broad range of training materials. Obviously, training needs can differ from person to person depending on their situation, so it’s important to cater to a broad range of requirements and provide a wide range of topics to choose from. I want total control over my training and learning. This expectation can once again be traced back to their focus on technology, and their expectation to be able to consume information where and when they need it. As a training or learning professional, you undoubtedly have legacy systems in place. That doesn’t mean that your hands are tied. By taking a step-by-step approach, you could soon be offering your consumer learners the type of learning and training they expect and want. If you noticed that your customers were changing the way they interacted with you, you would probably carry out some market research to find out what was going on. Apply the same approach to your learners. Don’t be afraid to ask questions to find out what their “pain points” are and where they go for new information. Ask for regular feedback to tailor the learning experience to what really works for them. There is also a bonus to this approach. By seeing that you’re taking an interest and listening to them, your learners will feel more involved. As a result, they are likely become more engaged as you develop your training resources. To provide your consumer learners with the flexibility they so clearly want, you need to manage them less and empower them more. This means taking advantage of the fact that your people want to learn, and that they are already doing it in their own time. Build an environment and experience that they will enjoy, will want to return to, and will recommend to others. The power of recommendation is huge for driving up engagement in your training and learning strategy. Avoid thinking of training or learning as a task or a program that must be “completed.” Instead, it’s vital that learning is continuous and becomes a part of your culture. Your learners need to feel that their engagement in learning isn’t just noted, but also valued as a part of their personal and career development. You can reward this engagement with recognition and celebration of their achievements. Even the smallest acts of encouragement will help to establish your workplace as a positive learning environment, ultimately driving engagement and productivity in your organization. And as word spreads about how you value your people’s development, recruiting top talent may become that much easier too. Oliver Craddock is Deputy CEO of Mind Tools, one of the world’s leading online content providers for soft skills training and development.